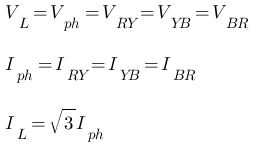 The break load on the induction motor can be taken as a balanced load on the I.M. The measurement can be done using the conventional ‘Dynamometer type of wattmeter’. Here the current coil of the wattmeter is connected in the R-phase, the pressure coil is connected between Y-phase and B-phases. Assuming that, Q = total reactive power.